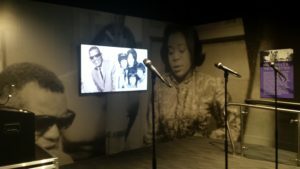 If you’re wondering why you haven’t heard of this Grammy outpost, it opened in Newark in October, 2017. 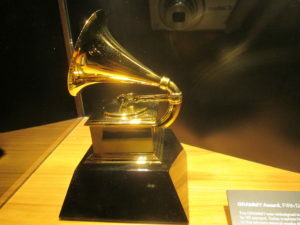 The Grammy Museum Experience at the Prudential Center focuses on Grammy winners through the years, and you’ll see an area showing the winning albums each year of the awards, with some interesting trivia. 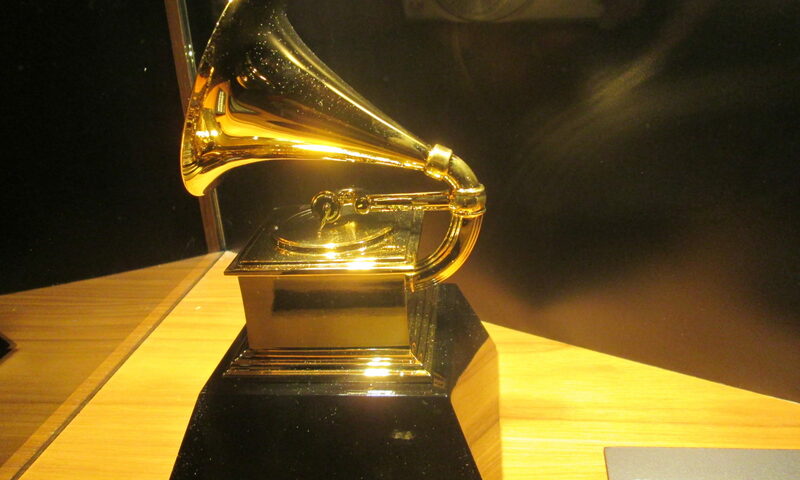 For example, the first Grammy Awards were in 1959, and weren’t televised. You can watch highlights of past Grammy performances , which was fun to see/hear, and a good chance to educate the kids (hey kids, that’s Patty Lupone singing a song from Evita – yes, I’m going to sing with her, out loud). 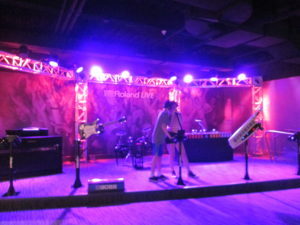 Aside from listening exhibits, there are several interactive exhibits where you can make your own music. The Roland Live area lets you mix music, and play the drums, guitar or keyboard (with the headphones on, so no one else can hear you, unless you unplug the headphones). Our favorite part was the microphone that changes voices to hip hop or robot (I forget the actual name of that last one, but it was spooky and hilarious). We spent a lot of time with that one. 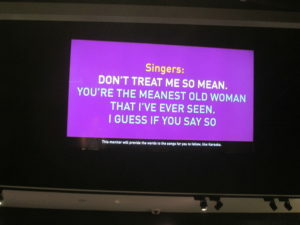 You can also sing along with Ray Charles and the Raclettes in a karaoke area – unfortunately if you sing out loud, though, others will hear you. That’s not a good thing for our family. You can play drums with Max Weinberg and rap along with Wyclef Jean (that one wasn’t working too well technically). Yup, I sang. The kids ran away. 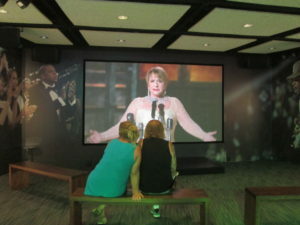 The Taylor Swift Exhibit took up a fair amount of the exhibit space. 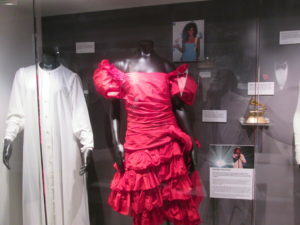 It featured costumes from her videos and tours, her 1989 piano, handwritten lyric sheets, bedazzled red microphone, a singalong Karaoke booth, video highlights of her tours and performances through the years, and some mementos from her youth, like her riding saddle. 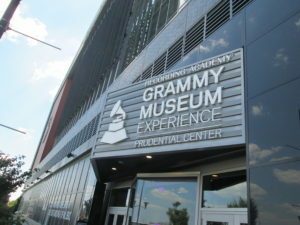 How long should you plan to spend at the Grammy Museum Experience at the Prudential Center? When we looked for that information before we went, we saw that people spent an hour or two there, two hours really being on outer extreme. 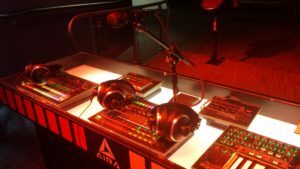 It depends how much you like music, how much time you have and how crowded it is (allowing you time on the interactive elements). We spent about 45 minutes there on a non-crowded day, and we were not rushed. This museum experience is on the smaller side compared to most of its sister museums. This one is 8,200 square feet, while the much larger Grammy Museums in Los Angeles is 35,000 square feet, and there are freestanding museums in Mississippi (27,000 square feet), and Nashville (7,000 square feet). If you don’t want to make a separate trip there, you can go before an event. Granted, it will be more crowded then, and you’ll have a harder time getting on the interactive elements. We went on a summer weekday and while we didn’t have the museum to ourselves, we didn’t have to wait for anyone. It’s priced for the size. When: On nonevent days, the museum experience is open from 11-6. On event days, it’s open 11-8. It’s closed on major holidays. Disclosure: The Grammy Experience gave us tickets to review the museum. All words and opinions are my own. Previous PostPrevious Review: Is Phantom of the Opera Appropriate for Kids? 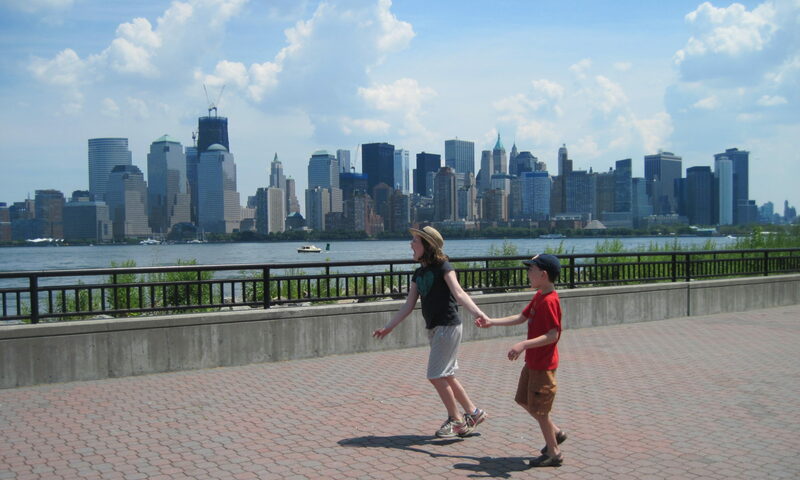 Next PostNext Review of Vitaly off Broadway – is it Vitaly Appropriate for Kids?